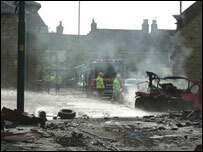 A driver was killed when a van carrying welding equipment exploded in a County Durham market town. Windows in shops and homes were left shattered and wreckage was strewn across the centre of Wolsingham, near Bishop Auckland. The 33-year-old local man, who worked as a welder near Durham, was in the van when the oxy-acetylene cylinders exploded. Homes near the scene were evacuated after the incident on Saturday. It is not yet known what caused the blast but Durham Police said there did not appear to be any suspicious circumstances. The victim, who is married, had stopped at shops shortly beforehand, but it is believed the van was moving when it exploded. Speaking on Saturday afternoon, a police spokesman said: "The centre of the town will remain cordoned off overnight and into Sunday. "One of the cylinders is still in the market place and has to be cooled down for no less than 24 hours." It is likely to be some time before the victim is formally identified, he added. One resident said the van was obliterated in the explosion, which sounded "like a bomb going off". Catherine Dipper, whose house was damaged by the blast, said: "I was woken by a big explosion and I knew it wasn't a firework or a car backfiring. "I went to investigate and found every single window at the front of the house had been blown in. "I ran to check on my son, who sleeps at the front of the house. He wasn't injured, but he was completely showered with glass. "Then I went to the front door and saw bits of the van everywhere." Ms Dipper was forced to leave her home and could face a wait of 48 hours before being allowed back. It is not yet known if buildings in the immediate area of the explosion suffered structural damage. No-one else was hurt in the explosion, on the A689 - the main road which runs through Wolsingham. Durham Police has set up two public help lines containing road closure details and related information. The numbers are 01325 742549 and 742565.